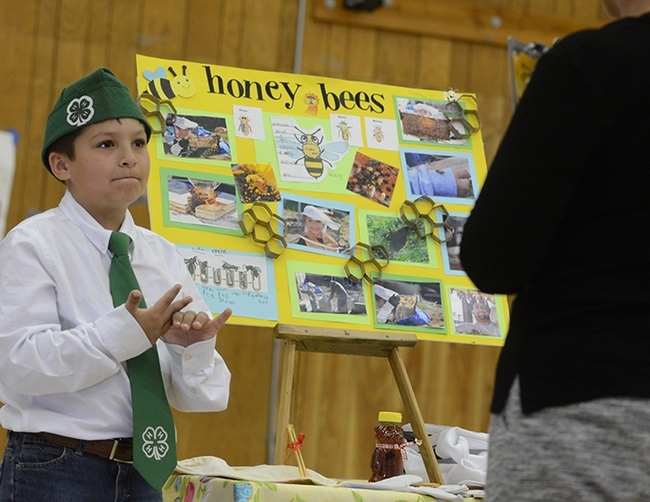 Youths who want to learn beekeeping might want to consider joining the 4-H program. 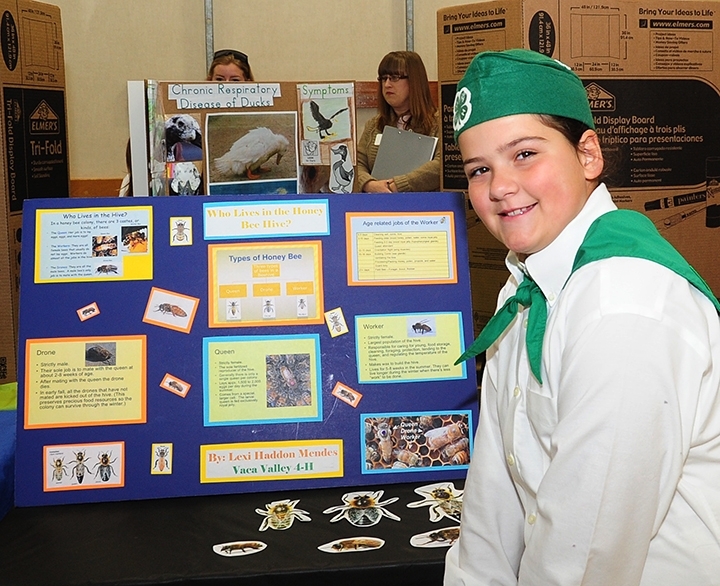 Take, for example, the Solano County 4-H Youth Development Program, part of the UC Cooperative Extension Program. 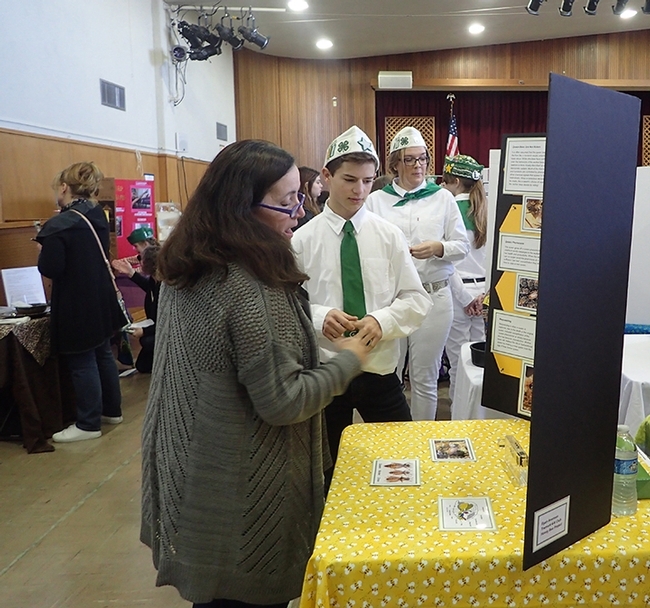 At the countywide annual Project Skills Day, held last Saturday, Jan. 20 at the Vaca Pena Middle School, Vacaville, scores of 4-H'ers showed what they've learned in their projects. The projects ranged from photography to pigs, from fishing to gardening, and from poinsettias to poultry. Ian Weber of the Vaca Valley 4-H Club, Vacaville, a second-year beekeeper, discussed "The Many Different Parts of a Bee Hive," explaining his project to evaluators and fielding their questions. 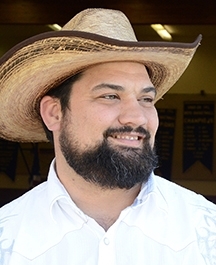 For his efforts, Weber won a showmanship award, one of 11 youths to win the top honor. He competed in the senior division, ages 14 to 19. Another Vaca Valley 4-H'er and beekeeper, Miriam Laffitte, entered in the junior division, ages 9-10, chose to discuss wax moths, a pest of beehives. She creatively titled her project "Wacky Wax Moths." 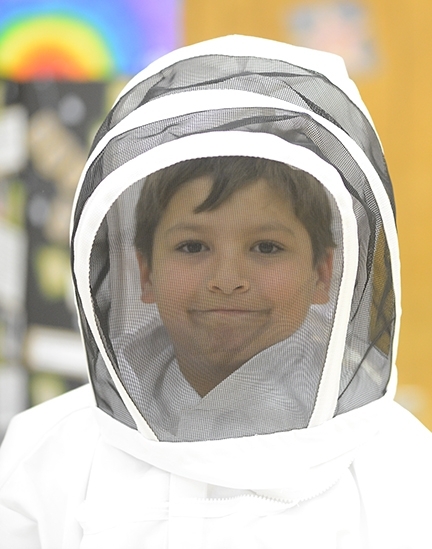 They are among the youths taught by beekeeper Garry Haddon Jr., the project leader. 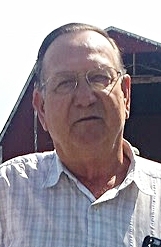 Like all the 4-H leaders, he is a volunteer who donates his time and expertise. "Project Skills Day is an opportunity for 4-H'ers to show what they've learned in their projects and demonstrate their showmanship skills," said Solano County 4-H Program representative Valerie Williams. 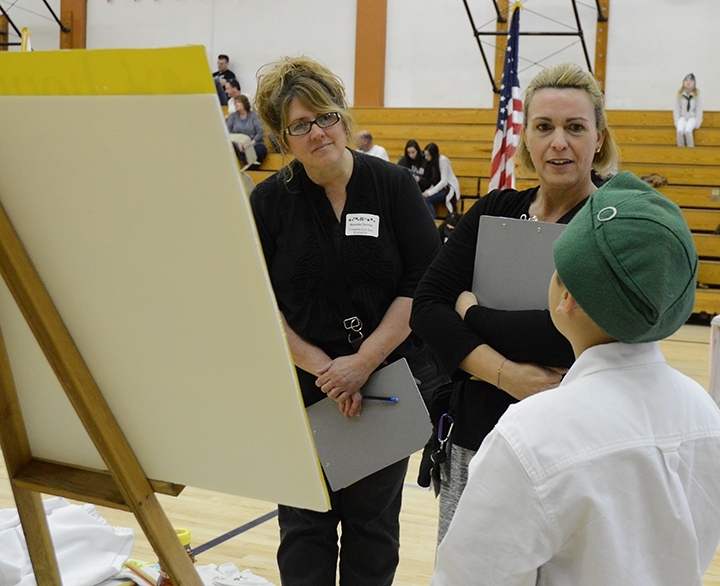 Evaluators, all 4-H volunteers, score the youths on their display, presentation, knowledge and interaction. 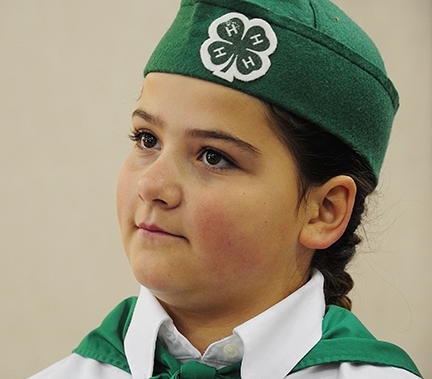 It's quite true that 4-H'ers (I'm speaking here as an alumnus and longtime adult volunteer) learn many life skills that they would not otherwise learn at home, or in public or private schools. And that includes keeping bees! 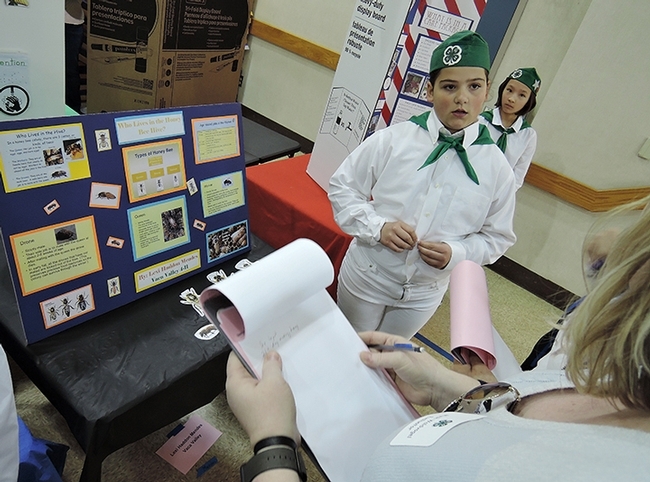 The 4-H Youth Development Program isn't just about cows and chickens. It's about other projects, too, from "A" to "Z." And "B." Don't forget the honey bees. 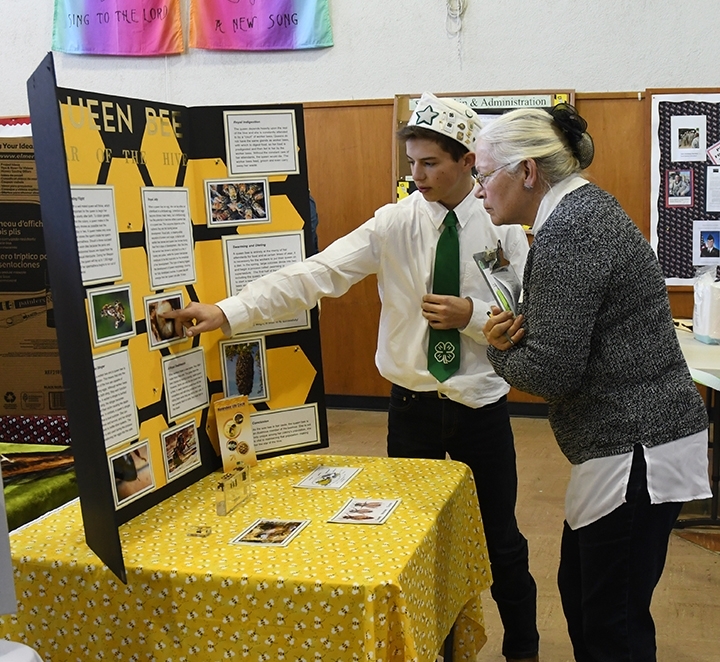 Solano County's Tremont 4-H Club, Dixon, has just launched a beekeeping project, led by adult leader Sarah Anenson. It's a first-year project that's small in numbers but big in enthusiasm. 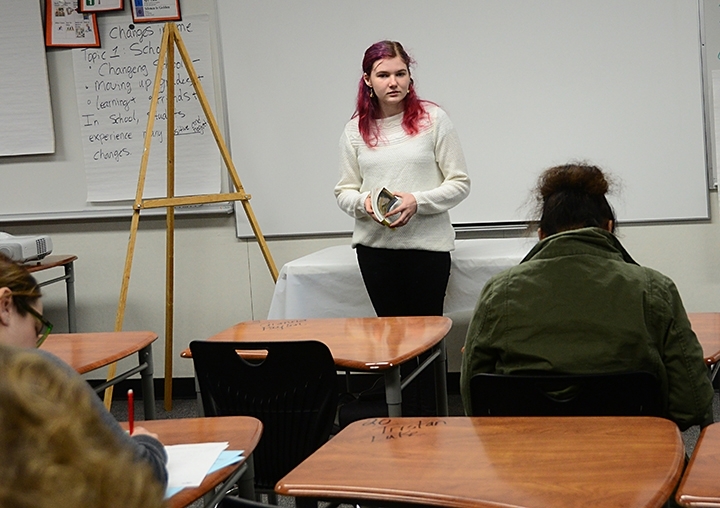 Her son, Ryan Anenson, 15, serves as the teen leader. Other members are Isabel Martinez, 12, and Caitlin Miller, 17. They're learning about bees and sharing the information. 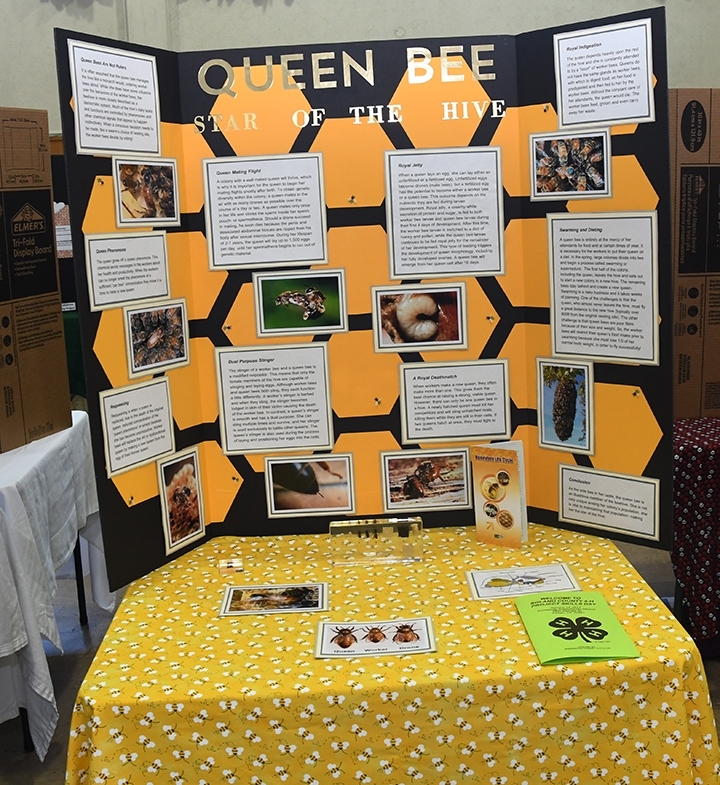 Ryan crafted an informational display board, "Queen Bee, Star of the Hive," for the Solano County 4-H Project Skills Day, held recently in Vallejo, and responded to questions from his evaluators. 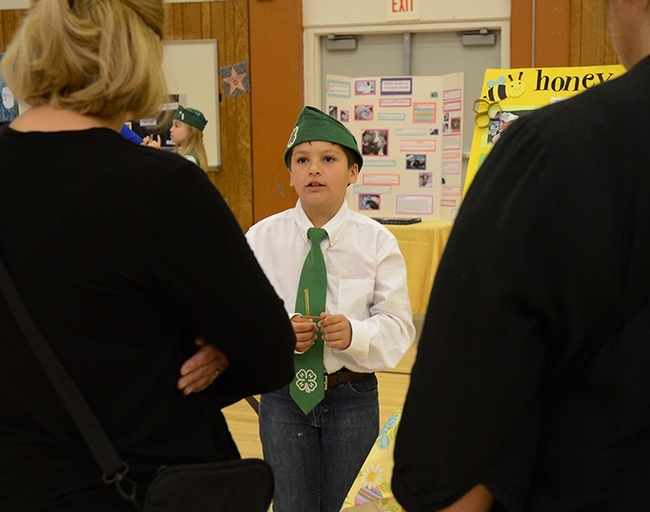 Solano County 4-H Program representative Valerie Williams described Project Skills Day as an opportunity for 4-H'ers to share what they've learned and to gain experience in presentation and interaction skills. One of the evaluators praised Anenson's presentation with: "Excellent presentation. You're knowledgeable and passionate on your subject. You were pleasant to talk to. Your eye contact, speaking ability and overall conversation was engaging and informative. We look forward to seeing you and your board at Presentation Day and beyond." 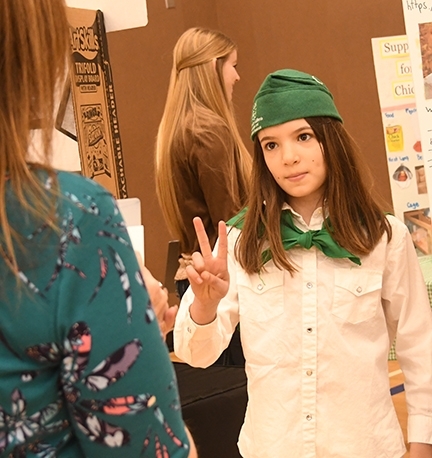 Sarah Anenson decided to launch the 4-H beekeeping project after walking to a local vintage fair and noticing an observation beehive surrounded by children of all ages. 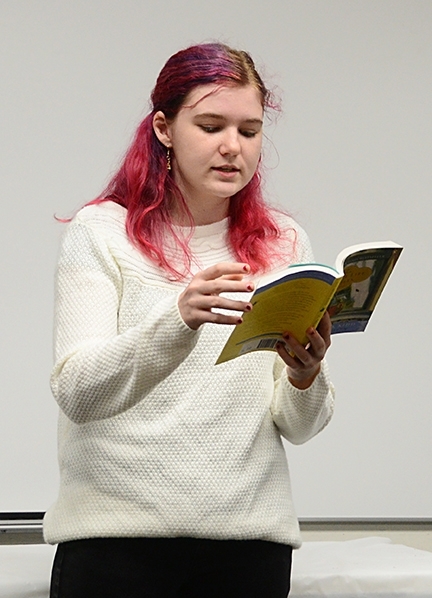 "They were fascinated by the bees and were a captive audience for hours--even our teenagers were mesmerized," she said. "It was then that we realized that a 4-H honey bee project would be beneficial for our youth. To help give our project a kick-start, we received our beehive and hive tools from our good friend, Mr. Don Ritchey." 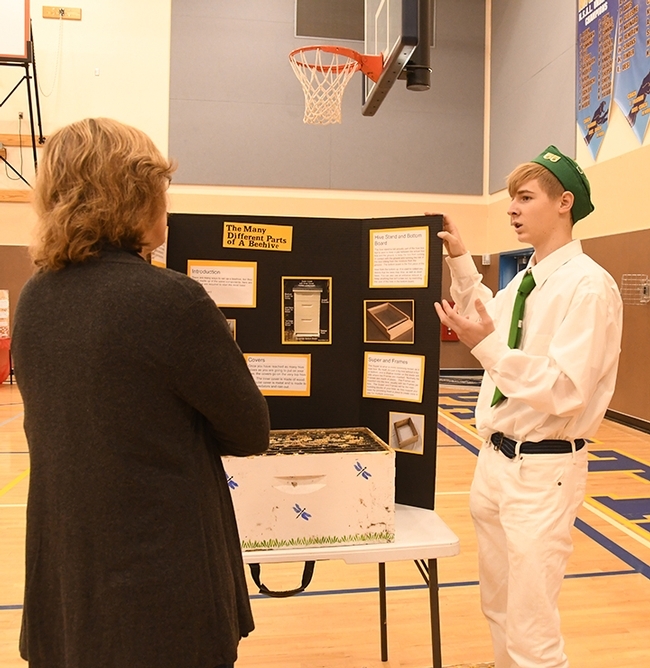 "In our honey bee project," Sarah Anenson explained, "we are covering a variety of topics including anatomy, beehive choice and maintenance, prevention and treatment of virus and disease, the many causes of honey bee death, the importance of providing food sources and creating our own bee gardens, as well as learning the importance of bee to agriculture and our lives." She added: "We are currently raising only one colony, though we hope to raise more in the near future. 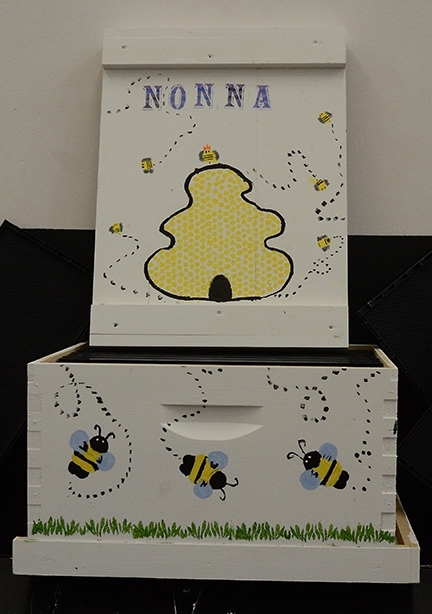 One of our hopes is that we will receive bee hive and honey bee donations from our community. 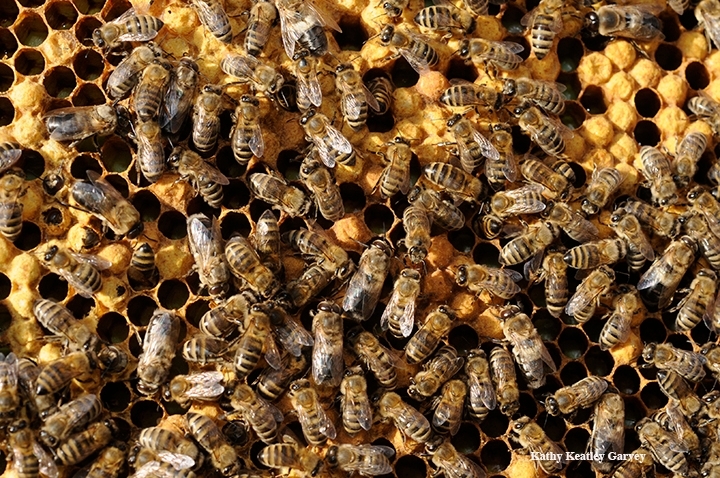 Raising honey bees, although highly beneficial, is costly to new beekeepers." 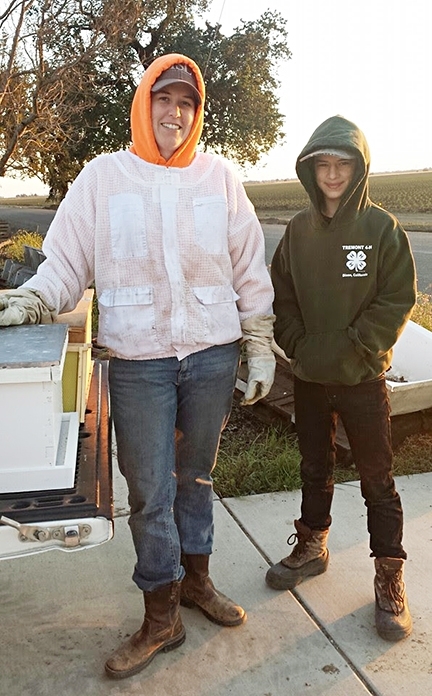 The Tremont 4-H'ers acquired their first honey bee colony last April from Breanna Sieferman of California Queen Bees, Woodland. The bees are now in a Dixon almond grove for pollination, which is expected to start around Feb. 14. "We are glad that our honey bees will help with the pollination of the almonds, but we are not seeking compensation," Anenson said. "We are simply happy to learn what we can about the honey bees, and at some point reap the rewards in honey." 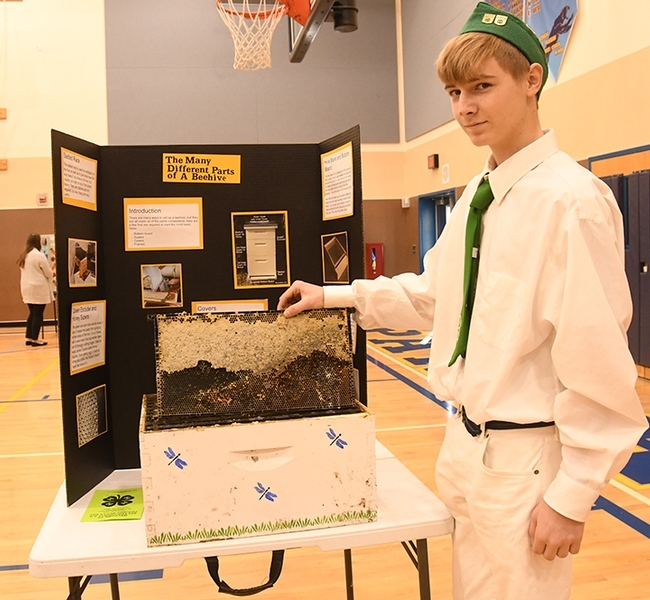 Meanwhile, Ryan Anenson is getting ready to share his beekeeping project at another countywide event, the Solano County 4-H Presentation, to be held Saturday, Feb. 25 at Tremont Elementary School, 355 Pheasant Run Drive, Dixon. The event begins at 10 a.m. and visitors are welcome. The Solano County 4-H Youth Development Program, part of the UC Cooperative Extension Program of the UC Division of Agriculture and Natural Resources (UC ANR), follows the motto, “Making the best better.” 4-H, which stands for head, heart, health and hands, is open to youths ages 5 to 19. In age-appropriate projects, they learn skills through hands-on learning in projects ranging from arts and crafts, computers and leadership to dog care, poultry, rabbits and woodworking. 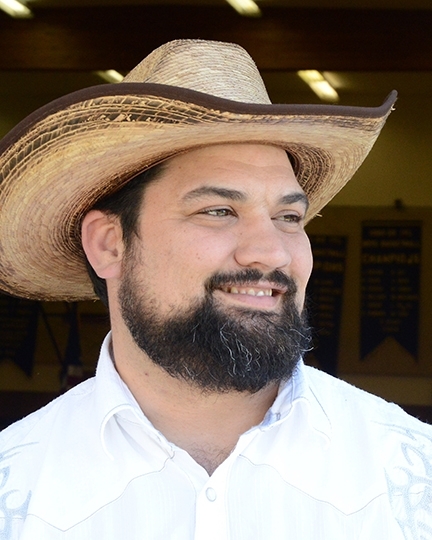 They develop skills they would otherwise not attain at home or in public or private schools, said Williams, who may be reached at vawilliams@ucanr.edu for further information on the program. 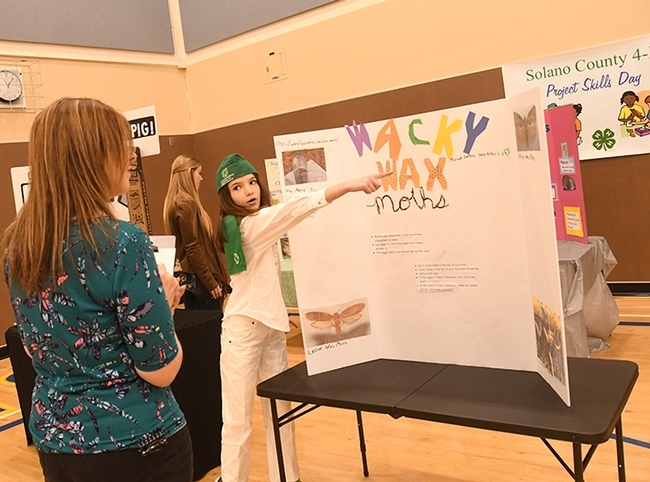 Solano County has 11 4-H clubs: Dixon Ridge 4-H, Maine Prairie 4-H, Roving Clovers 4-H and Tremont, 4-H, all of Dixon; Elmira 4-H, Pleasants Valley 4-H and Vaca Valley 4-H, all of the Vacaville area; Westwind 4-H and Suisun Valley 4-H, both of Fairfield-Suisun; Rio Vista 4-H of Rio Vista; and Sherwood Forest 4-H, Vallejo.